Happy first official week of Spring! 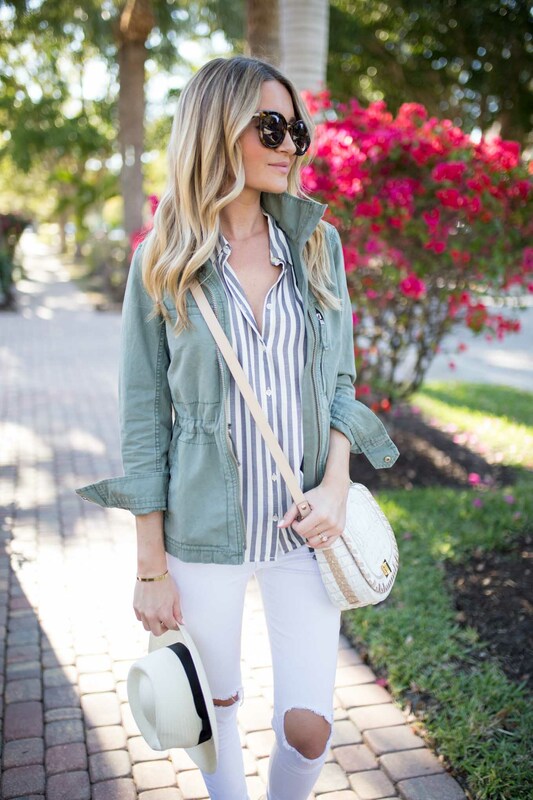 Today I’m partnering with Nordstrom to chat about some of my favorite spring accessories! This spring is a particularly crazy one for me, with the wedding coming up (y’all..the to-do list is never ending! ), travel and family – things have been all over the place. Because of this, I’ve been all about easy, do-it-all type of accessories! With traveling back and forth from New Jersey to Florida, it’s sometimes tricky to prepare for both climates. Being back in the warmer temps, I couldn’t wait to bust out my favorite espadrilles and pair them with some white denim. I’ve had this pair since last year and cannot rave enough about them. They go out of stock super quick, but this year there are a ton of other adorable styles to pick from! Pair them with a sundress, denim shorts or jeans – these babies will be on serious rotation in your spring wardrobe! 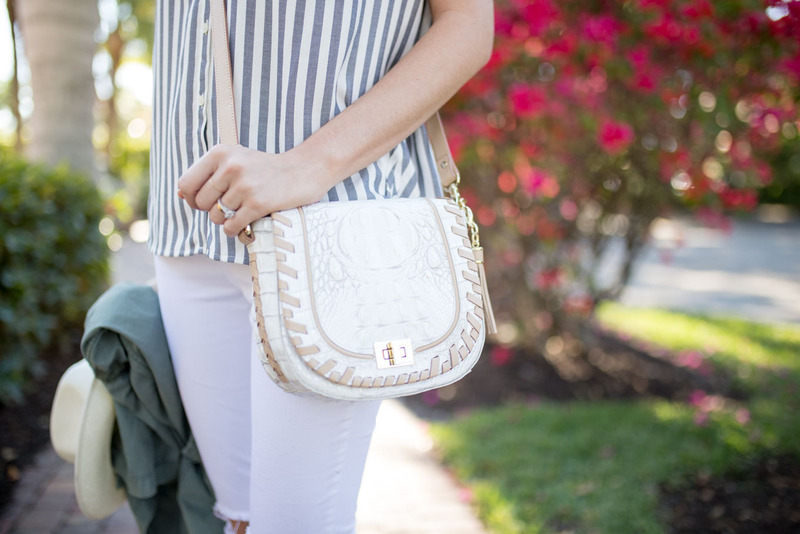 I’ve been searching everywhere for an everyday white cross body and was so excited when I found this one. I love the faux croc pattern and the darker tan stitching on the sides. It fits a water bottle, wallet, hand sanitizer and phone in it (with room! ), so it’s a great option that will go with any look in your suitcase for spring travels. I can’t wait to pair it with a fun summer dress on our next tropical trip! One thing I never have enough of are hats. I’m definitely a ‘hat lady,’ because a) I can go one (or two!) more days without washing my hair and b) the more sun protection the better! This fedora is a favorite of mine for both those reasons, along with the fact that it’s the perfect ‘finishing touch’ to a summer ensemble! Today’s post is in collaboration with Nordstrom. Thank you for supporting the brands that support Blonde Expeditions! I love your outfit. I see you are ready for spring. Had to come look at this post and schedule this to pin because I just love it so much. Spring perfection! 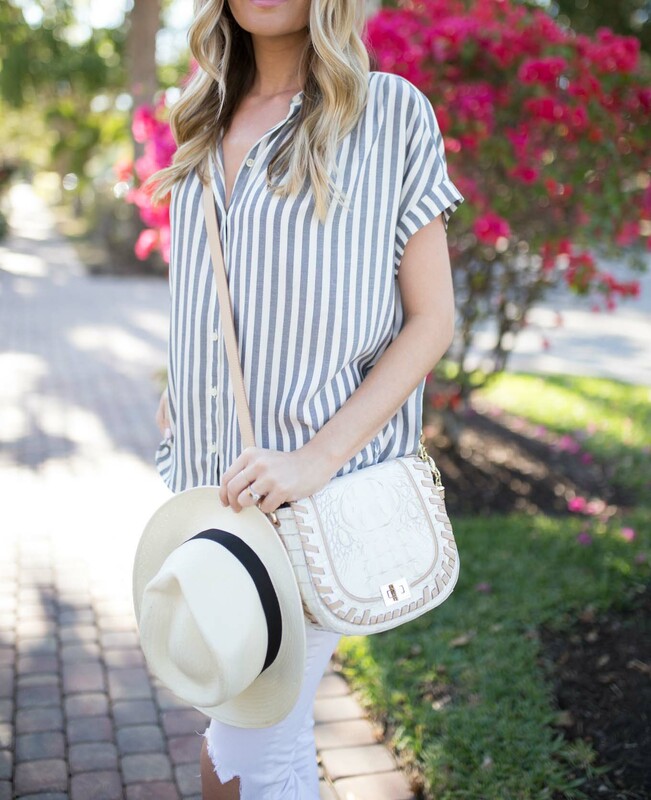 Love this top and hat! Great style!